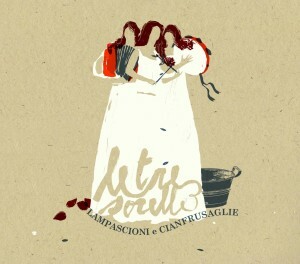 The songs included in our first album “Lampascioni e Cianfrusaglie” belong to the oral tradition of Calabria, Sicily, Apulia and Sardinia. Most tracks have been recorded in studio, some of them with the participation of other musicians adding colour to the songs with their instruments: mandolin, sicilian flutes, classical guitar, violin, double bass. Other tracks of the cd have been recorded in the workshop of calabrian luthier Mario Grimaldi, musican and researcher, who taught us some beautiful polyphonic chants accompanied with battente guitar, typical of Marchesato di Crotone, his area of origin. These songs, mainly unreleased, have been live recorded in his workshop, as a result of an absorbing and deep work of study and research. Recorded in the studio “Officina Sonora” by Davide Turbino in Turin. Illustration and graphic design: Paolo Berra -“Inamorarti”, Turin.